Enter the world of secret codes, cunning puzzles, and mind-bending conundrums. 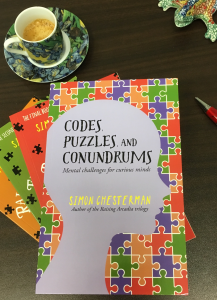 Inspired by the Raising Arcadia series, this book offers a step-by-step guide to each type of problem and then a quiz to test your progress. Use it to hone your own detective skills, or to baffle your friends and relatives. For more information about the Raising Arcadia series, visit this page. Or I suppose you could always walk into a bookshop and buy it in person. Can you decipher the coded message below? How about fixing the equation by moving the fewest matchsticks possible? 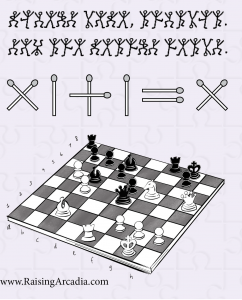 Or try to help white checkmate black in a single move? Answers are… in the book.